3D Photo Browser for Digital Camera for viewing, organizing and editing image (+80 formats), video, audio files, ZIP archives. It offers a fast customizable thumbnails window. It includes multi-folders browsing, an image editor (rotate, crop, resize, filters...), automatic rotation, batch processing, HTML exportation, converting capabilities, single image and contact sheet printing, screen capture, animated GIF, keywords edition, advanced search. ...... or make advanced search based EXIF or keywords critirias. 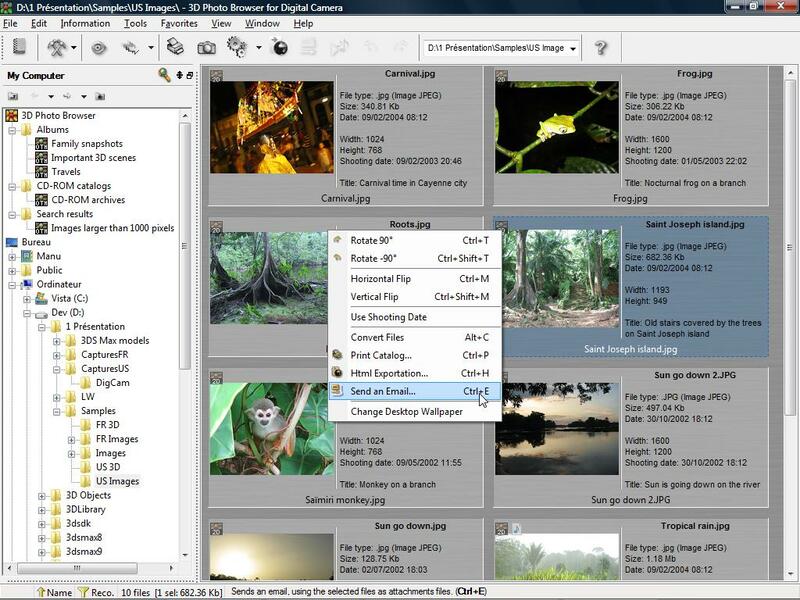 The image viewer includes a wide range of tools (rotate, crop, resize, filters...), slides show, conversion and printing features. Batch command feature allows applying a set of commands to a set of files. For example, you can - in a single step - resize, rotate, then convert to 128 colors a set of images. The screen capture tool is one of the most powerful of the market: if offers still image or movie capture from a window or a defined area, magnifier to assist with pixel-by-pixel cropping, capture preview, application live-state mode enable you to communicate visually with your entourage. Quickly and easily share your digital camera photos with friends and family. Qweas is providing links to 3D Photo Browser for Digital Camera 11.04 as a courtesy, and makes no representations regarding 3D Photo Browser for Digital Camera or any other applications or any information related thereto. Any questions, complaints or claims regarding this application 3D Photo Browser for Digital Camera 11.04 must be directed to the appropriate software vendor. You may click the publisher link of 3D Photo Browser for Digital Camera on the top of this page to get more details about the vendor.